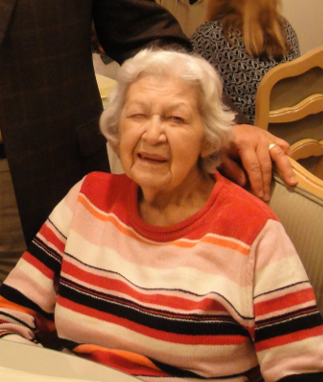 June Hagelbarger Comstock passed away at the age of 97 years 8 months and 9 days. She had resided at Mountainbrook Village in Sevierville, Tn for the past two years, where she passed away peacefully. June was the daughter of Walter J. and Cora Jane Workman Hagelbarger who precede her in death. She is also preceded in death by her husband of 71 years, Lester Ray Comstock, one son Lester Robert Comstock, one great grandson Michael Goulet and one brother Alfred Hagelbarger. She is survived by: two daughters and their husbands; Sue Ellen Comstock Ostrander and her husband Paul of Sevierville, Tn; Peggy Comstock Watson and her husband David of Orange Park, FL. One son and his wife, Roger & Charlotte Comstock of Gatlinburg, TN. She is also survived by 14 grandchildren; 24 great-grandchildren and 8 great great grandchildren. She is also survived by one sister-in-law, Velma Beihl Comstock of Utica, Ohio. She is also survived by a throng of nieces, nephews and many loyal friends. June grew up in the rural hills of NW Coshocton County Ohio, near the small town of Tiverton. She was born on the family farm as was her father. She loved farm life and helping her father on the farm. After finishing school she went to secretary school in Mt. Vernon and began working for Shellmar in Mt. Vernon where she met Lester, whom she would marry in 1945. The family moved to McConnelsville, Ohio in 1957 then move to Ft. Myers, FL in 1966. She and her husband, Lester moved to Tennessee in 2010. June was a faithful member of the Church of Christ virtually all of her life. She was a faithful and devoted wife, mother, homemaker and was befriended by anyone who met her. She was known for her constant smile, which described her personality. She loved music. Her favorite singer was Charlie Pride. The family gives a special thanks to River Terrace Assisted Living in McMinnville, Tn and Mountainbrook Village Assisted Living in Sevierville, Tn and to Amedisys Hospice for their loving care of our sweet mother. Also, a special thanks to Dale Layne of Layne Funeral Home in Palmer, Tn for his loving care and dignity which he cared for our parents in death. Visitation will be from 12:00 p.m. to 2:00 p.m. at the Lasater Funeral Home in Mt. Vernon, on Saturday Apr. 20, 2019 with the funeral beginning at 2:00 PM. Burial will follow at Union Grove Cemetery, in Gambier, Ohio. There's still time to send flowers to the Calling Hours at the Lasater Funeral Home from 12:00 PM to 2:00 PM on April 20, 2019.